One of the major requirements of any commercial set up is the necessity to lay network cables in a proper, orderly manner. Despite almost everything becoming wireless, this is one aspect which has not changed over the times. Any kind of wireless device requires a router to be connected with network cables. All devices- be it wearable’s, or smartphones, tablets or other gadgets- require a robust infrastructural backbone to stay connected to the Internet. Also, if the speed requirements are huge, then cables are essential for the process. 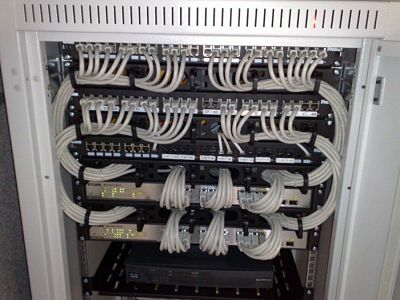 While superficially, it might appear to be a trivial task, Network Cabling Installation is anything but that. There are several issues to be handled, and there is a requirement to understand several basic underlying principles while working on it. There also is a necessity to understand the needs and requirements of the user, and decide upon a suitable architectural model. Any error or mismanagement while performing the job can cause a huge headache in the future, as well as recurring costs- both of which can easily be avoided if the job is done correctly. It is essential to understand what the requirement of the network is going to be 4-5 years down the line. This is because laying network cables is a costly and disruptive affair. If sufficient bandwidth is not selected, then you might have to suffer from lower speeds while everyone else utilizes the best that technology has to offer. At the same time, top of the line cabling can be very expensive- and if you decide to move your office after a couple of years, you will have to repeat the same process all over again. If your work requires only 1 Gbps of speed, laying lines for 1 Gbps is just a waste of money. Cable management requires a rack and holders for setting up and costs a bit of money. But the major point here is that it saves a lot of headache in the future, and ensures that your entire set- up remains modular, easily serviceable and easy to manage. The important thing to remember here is that the cabling process does not stop with the job. New devices are continually added and the number of cables keeps increasing. Hence it is important to develop a system which helps in identification and segregation of various lines. Another major mistake made by novices is that they run network cables along with electric cables. Due to the laws of physics, this causes disruption in signal and results in slow connections. The best way to avoid this is to run them at least perpendicular to each other or totally separately. This again needs the experience and knowledge only an expert can provide. The above reasons make it quite clear that there is a lot more to cabling than just laying lines. Choose the experts at VRS Technologies for the job, and stop bothering about your connectivity issues for a long time to come. Visit www.vrscomputers.com for more information and Call us at +971-55-5182748 for a free quote.